The Myers-Briggs Type Indicator (MBTI) is a personality test used to find out exactly what makes you tick. But the MBTI does not just have to apply to people. 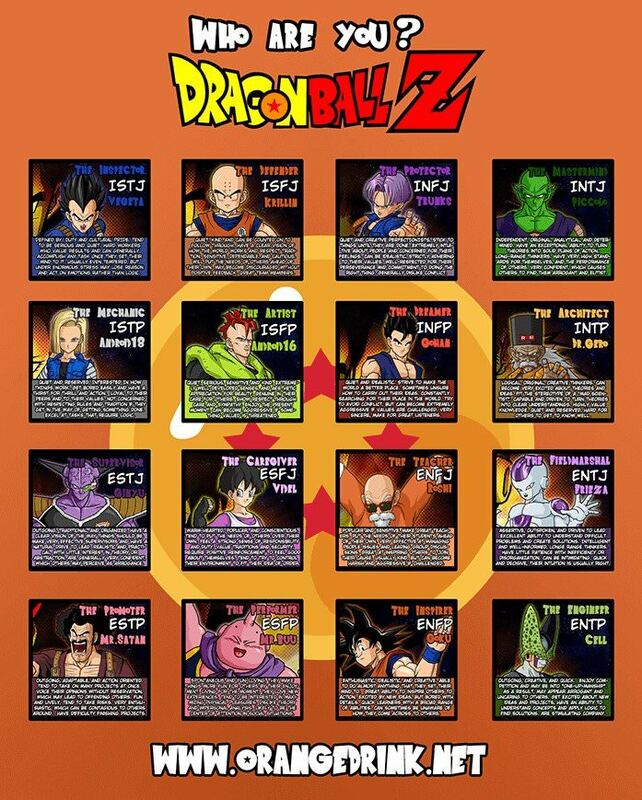 The Myers-Briggs test can be applied to a whole host of things from television shows to drinks to, yes, even Dragonball Z characters. Where do you fall on the list? The Myers-Briggs can be broadly broken down into four pairs of opposing traits. They are introversion and extraversion, intuition and sensing, thinking and feeling, or judging and perceiving. These eight traits can be combined to provide 16 different profiles to describe your personality. The first pair, introversion and extraversion relate to how people interact with other people. Introverts are more reserved. They feel less comfortable in a crowd and often need time alone to reflect on their experiences and recharge. Being in a crowd can feel both emotionally and energetically draining to introverts. Moreover, introverts may have issues with anxiety in crowds and potentially even agoraphobia. When you look for an introvert in Dragonball Z, think of Gohan. Extroverts, on the other hand, are completely opposite. They are often considered the life of the party and are likely to go a bit stir crazy if they do not get out and mingle with other people. Known to be talkative and friendly bordering on gregarious, extroverts not only love to be around people, they are quite literally energized by interacting with them. Able to float easily from person to person among a crowd, it is not altogether uncommon to find extroverts at a big event or just out on the town enjoying the electricity of public life. When you hear the word extrovert and think of Dragonball Z, Mr. Buu should come to mind. Intuitive people have a tendency to get their information from things that they fell they know, rather than things they that they physically perceive. An intuitive person is likely to trust their hunches when they come across an unfamiliar situation. However, this makes them very open to new possibilities as they believe they can intuit their way out of any trouble and can look for bigger patterns than the specific information laid out before them. On Dragonball Z, Dr. Gero is a good example of an intuitive character. Sensing people on the other hand have a tendency not to absolutely trust that little voice inside telling them something which they cannot see, hear, or otherwise sense. These personality types prefer information that they can verify empirically and are wary to trust someone who says that they have just “got a feeling” about something. Sensors live in the present and rely on the details or facts that they can ascertain from a situation to inform them. A Dragonball Z character who prefers sensing would be Vegeta. Thinkers make decision with their minds, not their hearts. They have a tendency to ignore other people’s feelings about a situation when making decisions, including their own. While this may lead to a more rational decision making process, it can also leave thinkers out on a ledge with other people whose feelings they may hurt when not taking them into account. When you think of thinker in Dragonball Z, think of Piccolo. Conversely, feelers not only consider other people’s feelings, as well as their own, when making decisions, they place a high value on those feelings when looking for a desired outcome. They may not necessarily make the most logical decision in all scenarios, but they try to make sure that the people involved are happy with the decisions made—ahead of time at least. An excellent example of a feeler in Dragonball Z is Videl. Despite the name, judgers are simply overly judgemental people. Instead, judgers prefer things to be ordered and structured. Chaos is the bane of judgers everywhere as they are not sure how to make sense of the situation, and they may become frustrated when trying to determine what to think or do about it. An obvious judger in Dragonball Z is Roshi. Finally, perceivers are not simply more perceptive than other people. However, perceivers love to have different things to consider when making determination or decision. They prefer a fluid approach that allows flexibility and will often jump from one idea to the next. But all of this flitting has its downsides as well, as perceivers have a tendency to get distracted or be a bit flaky. Goku is perceiver in the Dragonball Z universe. So take a look at the chart. Which Dragonball Z character are you?